We have solar panels and like many people want to make the most of the electricity they produce. There are products that can redirect any excess electricity generated to your hot water tank but they are of no use to us as we have a combi boiler and don’t have a tank. We use as much electricity as we can when the sun is shining – we put the washing and dishwasher on during the day, but still on sunny days we export most of it back to the grid. Immersun is a diverter product and when they got in touch to ask if we wanted to trial their product my initial thoughts were it was of no use to us, but a couple of people on the Microgen forum where I share my solar usage data were using the diverter products for heating via another means, so I thought it was worth investigating. So how does it work, well the Immersun measures the amount of electricity we are importing or exporting from the grid and if we are exporting diverts the same amount of electricity to a heating element. It checks this every few seconds so if we turn the kettle on or the sun goes behind a cloud it recognises it very quickly. Now the clever bit is that if you are directing the electricity to a heater it takes whatever electricity is available and gives it back as heat. 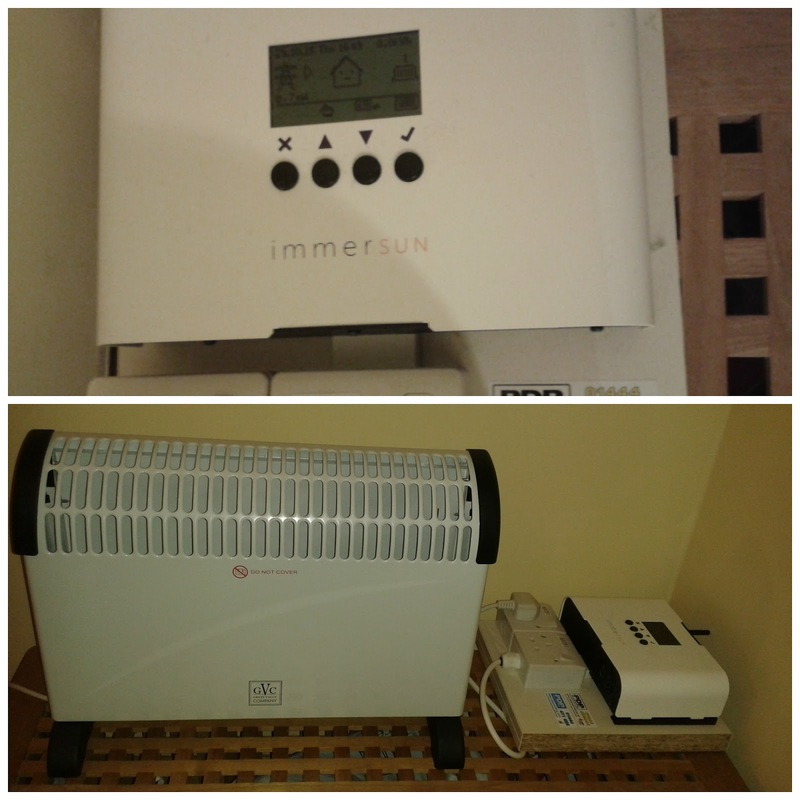 We had the Immersun installed by a very nice electrician. He turned up and asked where our hot water tank was, I explained that I wanted it to be used for plugging in a heater and that I wanted to be able to take it into different rooms as needed. After the initial surprise he said he could mount it onto a piece of wood with a couple of standard plugs on it and we can plug any resistive load onto them, eg. heaters or lights. We got the wireless adapter for the Immersun which meant that the main unit could be wired to a plug and therefore could be plugged in anywhere in the house and provide 2 (or even 3) plugs for use. We bought a 2kw convection heater and its now sitting in our hallway heating the core of the house. To be honest at the minute it’s over heating the house a bit as the outside temperature hasn’t been low enough and the sun has been shining quite a lot. I’ve even plugged my kettle into the plug and had a cup of solar powered tea from it. It took a few minutes to boil but hey. This system will not be of any use in the middle of summer and may not have a huge amount of use in the middle of winter. In Autumn and Spring though this has the potential to save us money on our gas bill and keep Mrs EcoThrifty warm on a cold day, as she spends most of her time in the house. If you are buying this setup it will cost you £400 – £500 (see here) plus installation depending on if you get the remote monitoring which isn’t essential but nice to have. The heater cost us £20 so it would take a while to pay for itself. The Immersun allows you to put in your electricity costs and it will tell you how much in Kwh and £/$ have been saved but the real saving for me will be how much less gas we use and how warm the house feels on a cold spring or autumn day. So watch this space for the next blog post to see how we get on with it as the trial progresses. For more information about the Immersun, take a look at their website here. This was a guest post from Mr ETL. If you liked this post please click like on Facebook and follow on Twitter – thanks so much! Disclaimer – there are affilate links in this blog post. This entry was tagged climate change, eco technology, gadget, guest post, renewable energy, review, solar panels, solar pv. Bookmark the permalink. ← Hoping for a hog in my hedge! It seems quite expensive but sure that will drop as technology progresses. You definitely need to have someone staying at home to make it pay back but that would work for many families. Great idea I say, looking forward to reading more posts about it in the future! You are right you would need to have someone at home to make it worthwhile. Thanks, . I stumbled on this while trying to see if an electricity supplier can now install me an export reading meter. You have an interesting alternative. Was there a second blog on this with your costings? If the installation costs are say £650 I guess you'd need to pump an awful lot of half price units through it to even break-even. What happens if you put say 200 watts into a 2000 watt heating element? Do you simply get 10% of the fire's normal heat output. Is your fire still alive. Might the elements burn out much quicker with an ever fluctuating load over 12 hours per day. Mr ETL's response: The heater is still going strong. You are right, put 200w into a 2kw heater and you get 10% output. The heater was only £25 so if it doesn't last years it's not the expensive part of the system. I don't know what the Immerson expected lifespan is but I'd imagine quite a few years as there is no major moving parts to fail. On your desire to get an export meter, you may well find it's not cost effective as you are deemed to export 50% anyway and in the next 5 years things could change enough for you to be able to use most if not all of your generated electricity (hopefully batteries will become more cost effective).